Using the My Rewards™ Gold Debit Card for everyday purchases can be very rewarding! Now, it's even easier to earn more valuable items in your rewards program. Each purchase you make with the My Rewards™ Gold Debit Card, will earn you 3 points per $100 spent. Remember, 100 points is all it takes to get a gift at the first level! You may redeem right away or save your points for bigger, better rewards in the future. To view all the available rewards, log in or create an account at www.capitalbanktxrewards.com and click "Rewards". Misplace your card? Get a replacement quickly and easily by calling (877) 702-3401. Shop online through the rewards website and earn cash back for your purchases. More than 100 popular retailers participate. Earn an average of 3.5% cash back from online merchants like Walmart®, Best Buy®, Office Depot® and more! Cash back amounts vary by retailer. If you have a Gold or Platinum Debit Card, log in to your account at www.capitalbanktxrewards.com and click "Shop Online" and "Shop Online Settings". Download My Rewards FREE app today for your iPhone®, iPad® or Android™ devices. Access the benefits of your My Rewards™ Gold Debit Card through your mobile phone with a direct link to your rewards account. With the My Rewards™ Gold Debit Card, you'll earn bonus rewards points when you shop online through the rewards website. With more than 100 popular online shopping sites, earning bonus points has never been easier. If you did all of your shopping online, imagine how close you could be to an iPod®, a plasma TV, a Caribbean Cruise, or even a new car! Bonus points amounts vary by retailer. If you have a Gold or Platinum Debit Card, log in to your account at www.capitalbanktxrewards.com and click "Shop Online". Enjoy savings on dining, local attractions, shopping and more. Get discounts and coupons for the places you go most. Coupons are accessible through the rewards website and the My Rewards™ mobile app. So, no matter where you go in the United States, you'll have access to the best area deals! If you have a Gold or Platinum Debit Card, log in to your account at www.capitalbanktxrewards.com and click "My Rewards Card" and "My Area Deals". To request assistance, please call 877-702-3401. If you have a Gold or Platinum Debit Card, log in to your account at www.capitalbanktxrewards.com and click "My Rewards Card" and "Rx Savings"
The My Rewards™ Gold Debit Card offers 24-hour roadside assistance, seven days a week, 365 days a year. This coverage consists of one event per year at $100. Whether you need a tow, a battery jump, fuel delivery, winching or a tire change, you're covered. To request assistance, please call (877) 702-3401. 2. One (1) year for all products whose OEM warranty is between six (6) months to three (3) years. To request assistance, please call (877) 702-3401. For additional information on the benefits available, please click here. If you have a My Rewards Debit Card, sign in to your account at www.capitalbanktxrewards.com and click "My Rewards Card" and "Hotel/Car Discount Codes". Using the My Rewards™ Platinum Debit Card for everyday purchases can be very rewarding! Now, it's even easier to earn more valuable items in your rewards program. Each purchase you make with the My Rewards™ Platinum Debit Card, will earn you five points per $100 spent. Remember, 100 points is all it takes to get a gift at the first level! You may redeem right away or save your points for bigger, better rewards in the future. Enjoy savings on dining, local attractions, shopping and more. Get discounts and coupons for the places you go most. Coupons are accessible through the rewards website and the My Rewards™ mobile app. So, no matter where you go in the United States, you'll have access to the best area deals! Shop online through the rewards website and earn cash back for your purchases. More than 100 popular retailers participate. Earn an average of 5% cash back from online merchants like Walmart®, Best Buy®, Office Depot® and more! Cash back amounts vary by retailer. If you have a Gold or Platinum Debit Card, log in to your account at www.capitalbanktxrewards.com and click "My Rewards Card" and Rx Savings"
With the My Rewards™ Platinum Debit Card, you'll earn bonus rewards points when you shop online through the rewards website. With more than 100 popular online shopping sites, earning bonus points has never been easier. If you did all of your shopping online, imagine how close you could be to an iPod®, a plasma TV, a Caribbean Cruise, or even a new car! Bonus points amounts vary by retailer. The My Rewards™ Platinum Debit Card offers 24-hour roadside assistance, seven days a week, 365 days a year. This coverage consists of up to three events per year at $100 each. Whether you need a tow, a battery jump, fuel delivery, winching or a tire change, you're covered. If you purchase an eligible item and see the same item advertised for a lower price within 60 days of the purchase date in either a printed advertisement or a non-auction Internet advertisement, we will reimburse you the difference between the original purchase price and the new, lower advertised price up to $250 per claim for up to 4 claims per year. Enjoy rewards at each level of the program that are reserved exclusively for My Rewards™ Platinum Debit Card holders. Electronics, special vacation packages and other high-end items will be available only to you. Periodically, we may offer special invitations to events that are only open to My Rewards™ Platinum Debit Card holders. As those events arise, additional information will be made available. If you have a Gold or Platinum Debit Card, log in to your account at www.capitalbanktxrewards.com and click "Rewards". Download My Rewards FREE app today for your iPhone®, iPad® or Android™ devices. Access the benefits of your My Rewards™ Platinum Debit Card through your mobile phone with a direct link to your rewards account. Using the My Rewards™ Business Platinum Debit Card for everyday purchases such as fuel, business meals and office inventory can be very rewarding! Now, it's even easier to earn more valuable items in your rewards program. Each purchase you make with the My Rewards™ Business Platinum Debit Card will earn you five points per $100 spent. Remember, 100 points is all it takes to earn a gift at the first level! You may redeem right away or save your points for bigger, better rewards in the future. To view all the available rewards visit www.capitalbanktxrewards.com/reward. 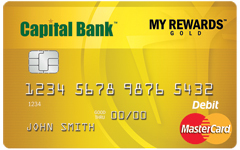 If you have a Gold, Platinum or Business Platinum Debit Card, log in to your account at www.capitalbanktxrewards.com and click "My Rewards Card" and "My Area Deals". Shop online through the rewards website for business supplies or personal needs, and you'll earn cash back for your purchases. More than 100 popular online shopping sites participate, including categories for business gifts & entertaining, office renovation, technology, car rentals & travel, office supplies, and more! If you have a Gold, Platinum or Business Platinum Debit Card, log in to your account at www.capitalbanktxrewards.com and click "Shop Online". If you have a Gold, Platinum or Business Platinum Debit Card, log in to your account at www.capitalbanktxrewards.com and click "My Rewards Card" and Rx Savings"
With the My Rewards™ Business Platinum Debit Card, you'll earn bonus rewards points when you shop online through the rewards website. With more than 100 popular online business and personal shopping sites, earning bonus points has never been easier. If you did all of your shopping online, imagine how close you could be to earning new electronics for the office, travel bags and luggage sets, even a Caribbean cruise when you need a much-deserved break from work. If you have a Business Platinum Debit Card, log in to your account at www.capitalbanktxrewards.com and click "My Rewards Card" and "Hotel/Car Discount Codes". The My Rewards™ Business Platinum Debit Card offers 24-hour roadside assistance, seven days a week, 365 days a year. This coverage consists of up to three events per year at $100 each. Whether you need a tow, a battery jump, fuel delivery, winching or a tire change, you're covered. Enjoy rewards at each level of the program that are reserved exclusively for My Rewards™ Business Platinum Debit Card holders. Electronics, special vacation packages and other high-end items will be available only to you. Periodically, we may offer special invitations to events that are only open to My Rewards™ Business Platinum Debit Card holders. As those events arise, additional information will be made available. If you have a Gold, Platinum or Business Platinum Debit Card, log in to your account at www.capitalbanktxrewards.com and click "Rewards". When travel is charged to card holders' Business Platinum Debit Cards, they (and any eligible family members) are automatically insured up to $100,000 against accidental loss of life, limb, sight, speech or hearing occurring on a common carrier covered trip. Download My Rewards FREE app today for your iPhone®, iPad® or Android™ devices. Access the benefits of your My Rewards™ Business Platinum Debit Card through your mobile phone with a direct link to your rewards account. Access to certified technicians 24x7 to keep card holders' smartphones, tablets, computers, and networks running. Remote support allows users to get technical problems resolved immediately and affordably, without having to visit a repair shop or wait for a technician to visit their home. If you already have a www.capitalbanktxrewards.com account, please log in and select Card Settings from the My Rewards Card menu.